Salzburg is a province (Bundesland) in the heart of Austria. It has a population of approximatley 530,000. 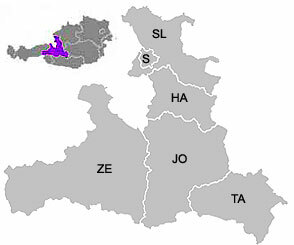 Salzburg is divided into six districts (Bezirke): Hallein (HA), Salzburg-Umgebung (SL), Salzburg (S), St. Johann (JO), Tamsweg (TA) and Zell am See (ZE). In these, there are 119 muncipalities, of which 10 are cities (Stadt) and 25 towns (Marktgemeinde). Back to: "Salzburg Sightseeing Guide"